‘W.E.L.D.E.R.’ Review – Save the Words from Going Extinct! 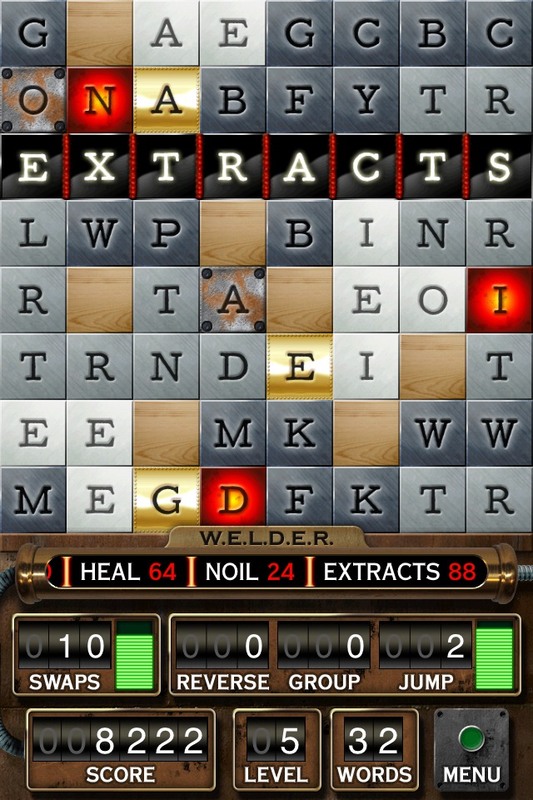 Highline Games have released W.E.L.D.E.R. [$1.99] which stands for ‘Word Examination Laboratory for Dynamic Extraction and Reassessment“, The amusing game trailer (below) suggests that words are at risk of becoming extinct, but that’s not really part of the gameplay. It’s just more interesting than saying: “Move letters around to form words", which might sound dull and done-to-death; but this intriguing word game is neither of those things, it’s unique and will activate your brain. 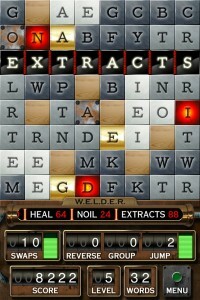 The game features an 8×8 grid which is full of letter tiles. The idea is to form words with four or more letters, by moving letter tiles around in various ways. The “Basic Swap" involves tapping any two neighboring letters (horizontally, vertically or diagonally adjoining) so they swap positions. The words must be written from left-to-right or top-to-bottom, much like a crossword puzzle. There’s no time limits (thank goodness), although a certain number of words must be formed to complete each level. As you play, you can unlock three other types of swap: A “Reverse Swap" is done by selecting a bunch of letters, then double tapping to reverse their order. “Group swaps" involve selecting some letters, then dragging them over one space. And finally, the useful “Jump swaps" let you tap any two movable letters on the board (even if not adjoining) and they’ll exchange places, as if teleporting. But you only have a limited number of each swap type. 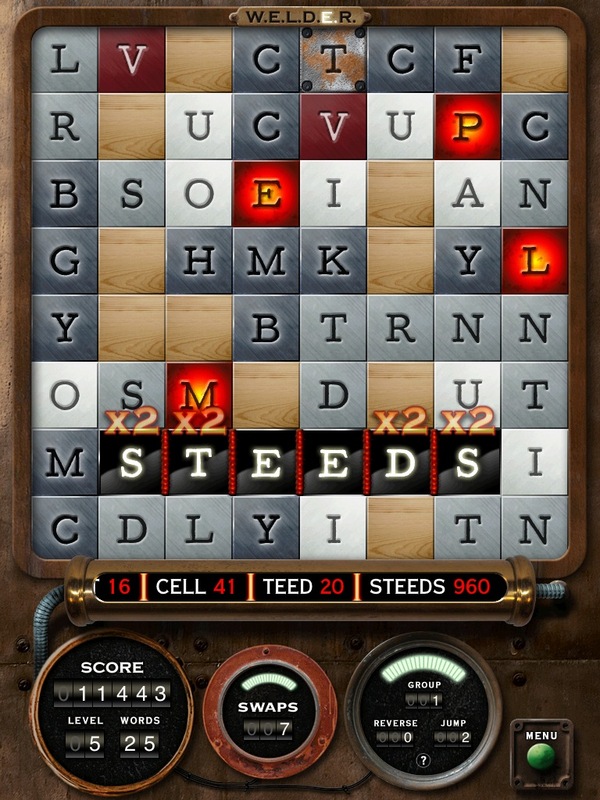 When you form a word, those letter tiles disappear, and any letters above cascade down to fill the gap, including some new letters. Therefore, it’s wise to form words near the bottom of the screen, so more letters fall from above, increasing the odds of creating another word by luck. Although, this is definitely a game of skill, where a puzzle-loving wordsmith will triumph. At the start, you’re only given 25 basic swaps to achieve the target number of words for the level. Once your swaps are depleted, the game ends. But if you form valid words, you earn points, and receive more swaps, allowing you to play longer. Five basic swaps are given for each 250 points, with special swaps given each 500 points. Little on-screen meters display how close you are to receiving the next batch of swaps. There’s also some special tiles: Words which incorporate gold tiles double the score, there’s diamond encrusted 3x score multipliers plus a 4x multiplier. Blank wooden tiles can be stamped permanently with any letter by double tapping, but this costs one swap and scores no points. Red-hot letter tiles are apparently too hot to touch, so you can’t swap them, but they fall like regular tiles if you form words below. Broken tiles can’t be moved either, but these don’t fall. The un-moveable tiles can be removed by forming a word around them. Like Scrabble, each letter has a different point value and bonus points are awarded for forming multiple words in the same turn. At the end of the level, bonus points are also awarded for any unused swaps. Final scores are fed into five Game Center leaderboards, along with a healthy 47 achievements. The game also supports iCloud game saves, allowing players to switch devices and resume playing. The dictionary word-set seems reasonable, although some valid words are declined. Rude words are not permitted and this extends to some body parts. And the word “Mens" (with a diamond M) was declined. But overall, the game has correctly identified almost all of the words entered. If you’re not familiar with a word formed, you can tap it to view the definition. And the developers plan to add support for additional languages in future. And you can submit words to the developers. The in-game music is unusual, yet strangely soothing and deserves a mention. It sounds more like ambient background noise; almost a mixture of white noise, an old fashioned oxygen machine, with the occasional fan. At first I thought the music was faulty, then I wondered if it was using monotonous sounds to hypnotize me into a trance, to hold my attention …and if so, it’s working, because the more I play this game, the better I become and the more enjoyable the experience. There’s a couple of things to watch out for. As soon as a word is formed, it’s scored and removed, so if you plan to make the word “Toaster", and form it from left to right, the game would recognize “Toast" as a word and the letters would disappear before you wrote the full intended word. Therefore, long words should be formed from the outsides in, to avoid accidentally spelling any small words. It’s also easy to move letters unintentionally. Firstly, because the “C" and “G" characters start looking similar after a while. Or secondly, by tapping the screen without realizing another character’s already selected, wasting a precious jump swap. These recurring human mistakes are frustrating since one bad move can end your game. Lastly, the game rules button takes you to a website, which is fine …providing you have WiFi access. W.E.L.D.E.R. has twelve levels, which grow longer and use more challenging tiles as you progress. The games become quite slow and considered once your supply of swaps dwindles and you search for an elusive swap, but that’s a good thing because this game challenges you. The developers advise other gameplay modes are planned, so we’re curious about what comes next. For this initial release however, W.E.L.D.E.R. 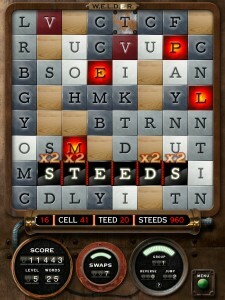 is one word game that has captured my attention, and is worth checking out.